Paige has a secret. A terrible, horrible secret. The worst part: she doesn’t even know what it is. Her elvish mother’s heritage set her apart. Her father’s secret ripped her world apart. And her sister’s capture tore her apart. Paige’s life wasn’t perfect, but she was happy. But when her village is attacked, her people slaughtered, and her sister taken hostage, Paige soon learns that her parents harbored a deep, dangerous secret – a secret her sister, Olivian, may end up paying the ultimate price for. Running for her life, Paige stumbles into a small, but formidable ragtag Brotherhood of rogue warriors hiding in the forest. Her challenge now lies in convincing them to help her rescue her sister from the clutches of the same wicked prince who tore their lives apart, all while discovering the secret that destroyed her world in the first place. 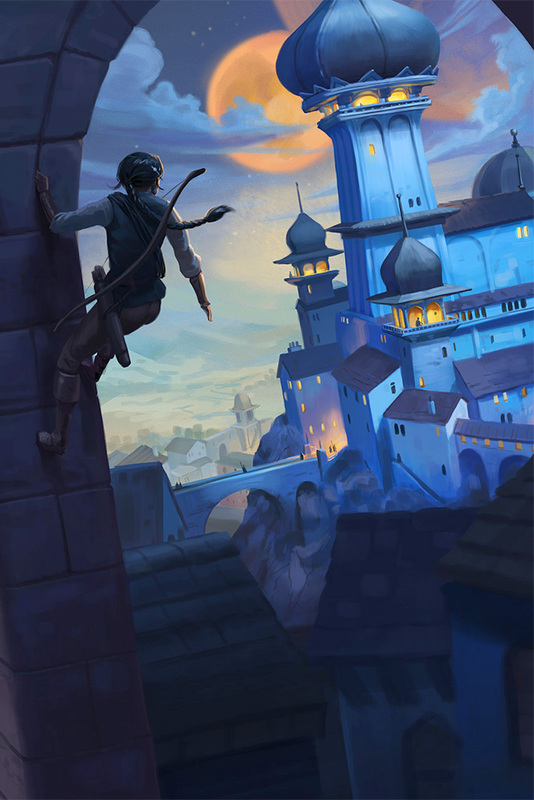 Filled with heroic tales, thrilling action, and non-stop adventure, this first installment of the ‘Eirensgarth Chronicles’ will take both young adults and old alike for the quest of a lifetime one page at a time! As usual- I had a good time doing this. Book covers are one of the most satisfying things to illustrate. Thanks again Phil for the generous creative freedom! 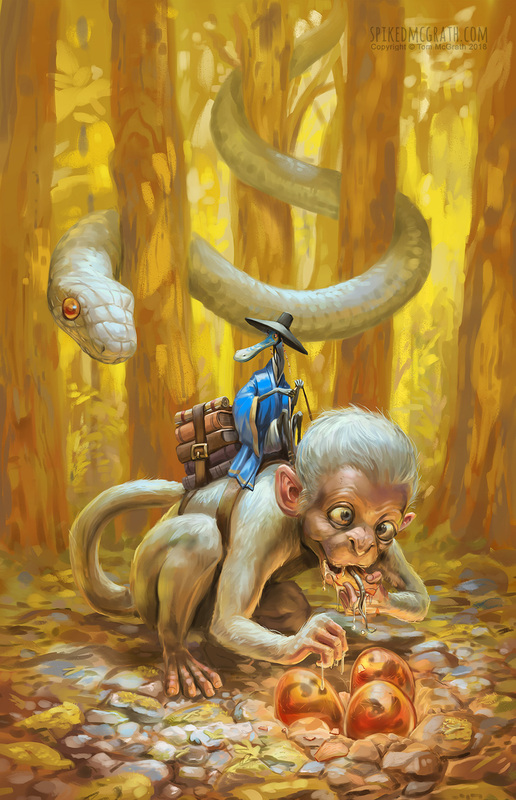 Here’s some recently completed work that I did for Author Jim Hodgson and his latest YA (young adult) series dubbed “Ozel the wizard.” Here’s the blurb from the back of book one- Apprentice Quest. Ozel wonders if he’ll ever escape his angry, fat caretaker. As the orphan hopes for a better future, a mysterious wizard gives him the gift of an apprenticeship and some unbelievable magic. But when Ozel discovers he’s the lone heir to a massive fortune, he’ll need more than a few spells to claim it. After learning his portly caretaker plans to steal the money first, Ozel races through a forest of blacksmiths, witches, and even the undead to protect his birthright. If he survives the treacherous Tangul forest, the orphan and his wizard may just have to stop a twisted mage to go from zero to wealthy hero. 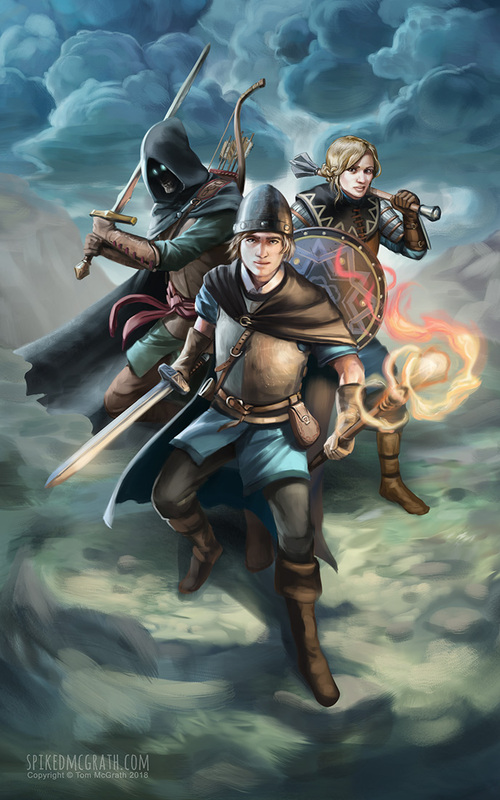 Apprentice Quest is a young adult fantasy novel full of action and humor. 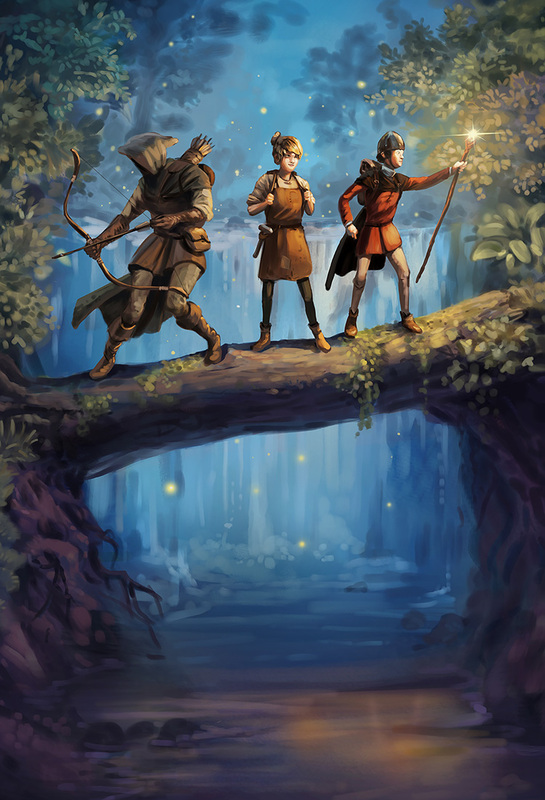 If you like powerful wizards, twists and turns, and coming-of-age tales, then you’ll love Jim Hodgson’s worthy successor to the magical genre. 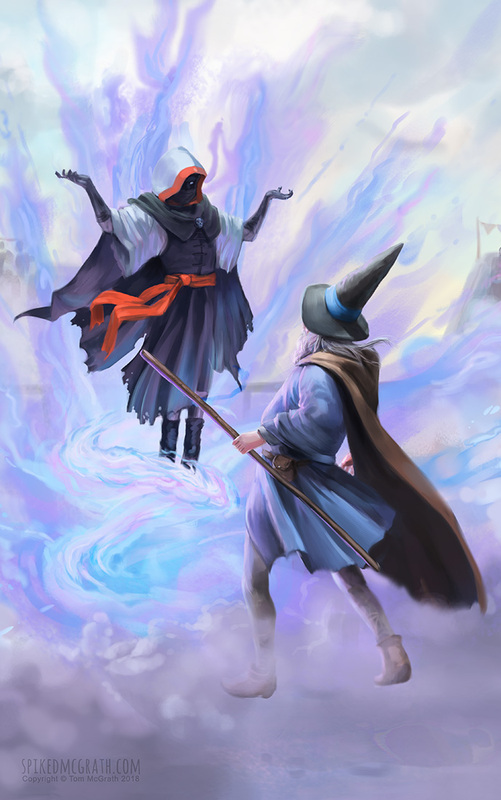 The last book in the series- Wizard’s Resolve– launched just before Christmas. If you’re looking for something that has wizards in it and doesn’t include all that tedious Quidditch nonsense then check it out over on Amazon. It was a great pleasure to work with Jim, and hopefully the future will see many more opportunities to do so! An image immediately popped into my head. It’s rare that that happens! It was a fun little distraction from my “proper” work, and a nice excuse to experiment with style and some new brushes in Paintstorm. Knowing is all well and good. But doing is something else entirely. 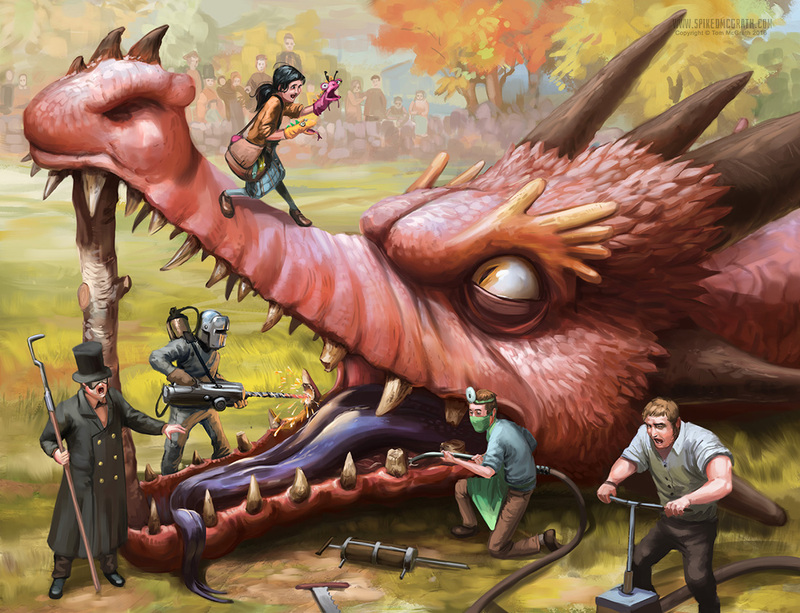 It is a truth universally acknowledged, that a dragon in possession of a good fortune, must be in want of a dentist. You see- for all their bluster and burning- roaring and devouring- dragons have yet to invent the electric toothbrush- and consequently have very poor oral hygiene. One point to the humans I say. 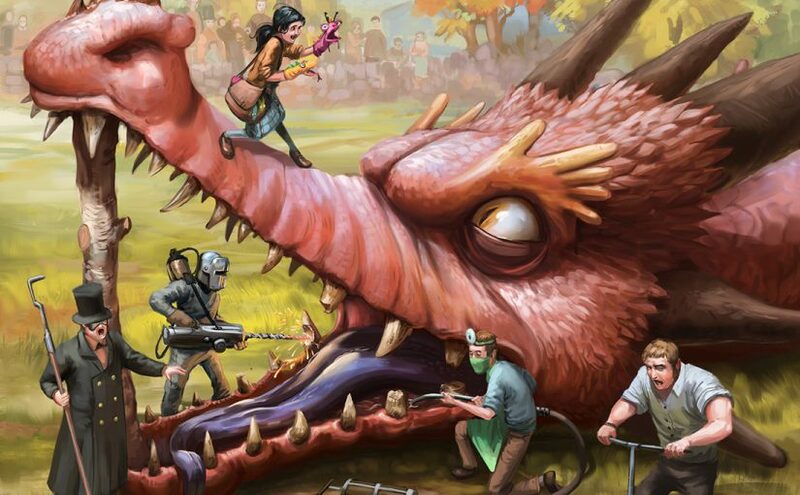 Indeed it’s a common theory that serious toothache is what makes dragons so narked off all the time. Thus it makes good sense to help them out with their gnashers just to ensure they don’t get all agitated and torch a primary school. Here we see routine operation to remove a rotten tooth. Dr Pimm directs proceedings while second son Toby dons the asbestos suit (for safety) and operates the no 4 drill. Eldest son Arthur operates the saliva pump while 3rd son Anthony controls the nozzle. Of course the best way to placate a dragon while operating is to use sock puppets- a job which falls to the youngest Pimm- Maggie- who isn’t technically a son but isn’t worth changing all the branded stationary for either. 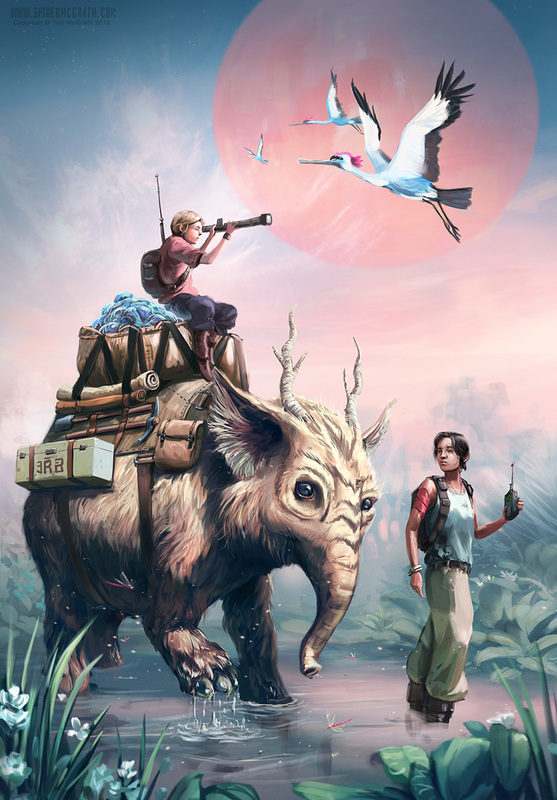 They’d been travelling for almost a year now, a long journey through fens and swamps, badlands and scrublands, across the cratered plains where the huge trees grew- nervously watching the skies and scanning the tall grasses. At last they had reached the rift basin. They were close. Signe waded knee deep through the tepid waters. The heat was sweltering- an oppressive, humid, damp that stuck her clothes to her skin and never allowed a single moment of comfort. 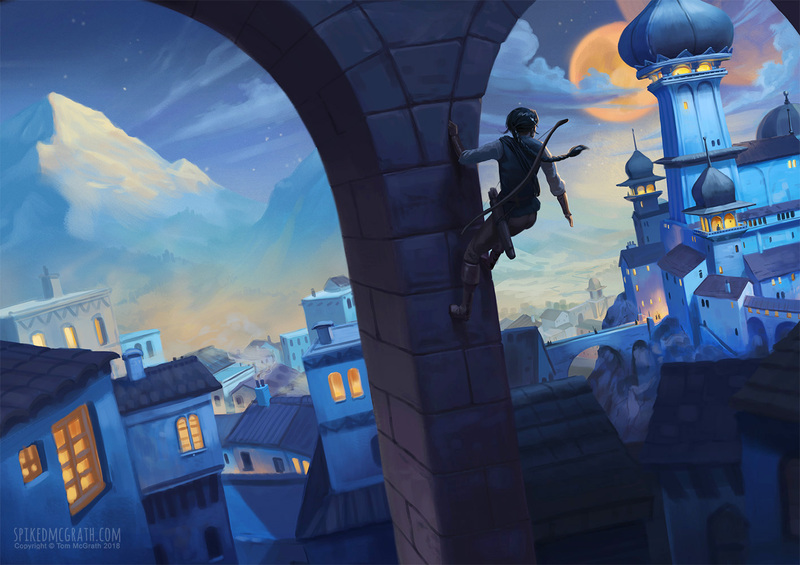 Ragna sat high up on the back of Torvald- resting atop the truffle baskets and scanning the horizon with her scope. So far from the colony you could never be too careful. 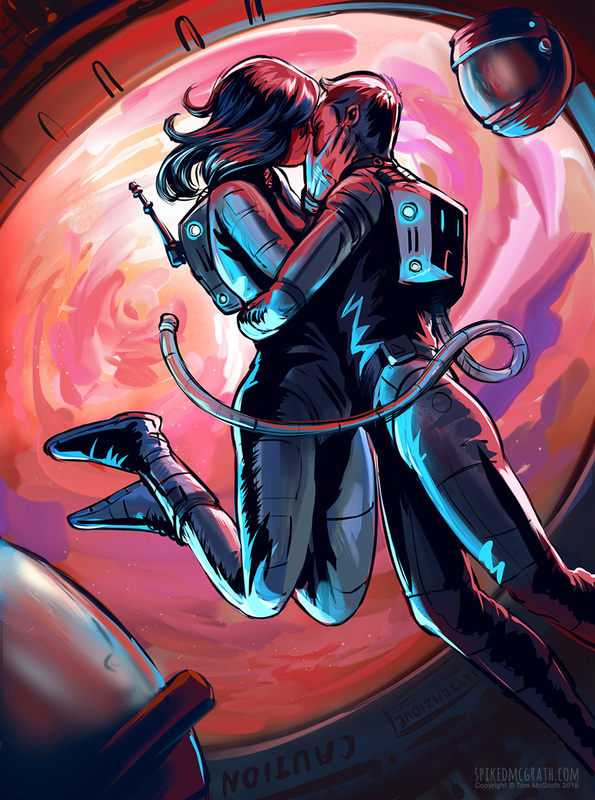 It would soon be time for them to return, back to the distant frontier colony with their precious cargo of meteor truffles- the vast luminous fungi that grew only at the site of fallen meteors. One truffle could keep the colony going for half a year- lighting, utilities, recharging the energy rifles- it was all powered by meteor truffles. But truffle hunting was dangerous business, there were beasts aplenty, vast and harsh wilderness to traverse, disease , injury and starvation an ever present threat. Many hunters left the colony each year never to be seen alive again. I just finished reading Robert Fawcett’s “On the art of drawing”. Fawcett himself was an en exceptional draughtsman and a respected illustrator in his time, overcoming the obstacle of his colour-blindness with his incredible eye for pattern, tone and composition. 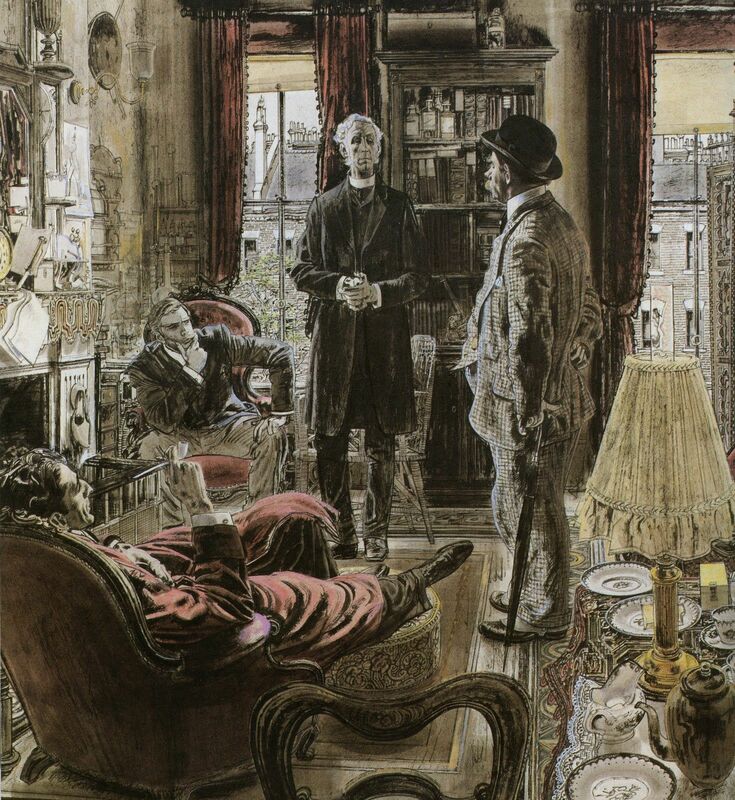 Illustration by Robert Fawcett from Sherlock Holmes. Look how busy this picture is! And yet it reads beautifully, with all sorts of little treats for your eye. That said, his writing did not provide the insight into his creative genius that I was hoping for. Robert Fawcett is a great illustrator, but this is not a great book. His passion for the subject is clear, but I was hoping for more insight than I got, especially considering the length of the book. Odd then, that he found the need to fill so many pages. 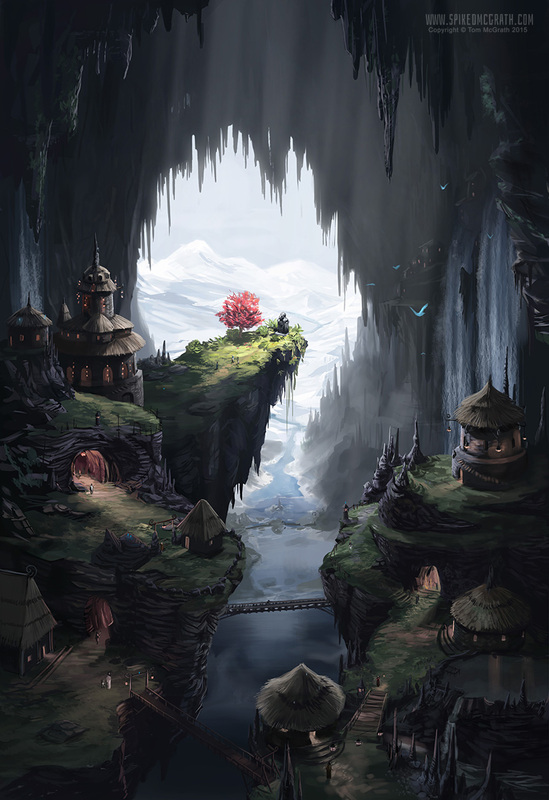 At the confluence of the great subterranean rivers, beneath the green glaciers and sheltered from the blinding snowfields lies the isolated settlement of Cavetown. Many generations ago the nomadic tribes of the frozen tundra took shelter in this cave and have remained there ever since- their small band growing into the prosperous settlement you see today. In the middle, towards the top- you can clearly see the temple garden where the high priests congregate. This is one of only three places in the cave where sunlight reaches, and where plants can grow, giving it great significance to the people. Only during festivals or ceremonies are citizens permitted to enter the garden, and fallen leaves from the holy red tree are worth a half-dozen catfish to the average villager. To the left of the garden is the temple itself- its many lanterns burning fiercely. A typical example of Cavetown architecture- it uses a strong stalagmite as a central pillar on which the roof is supported- the roofs are thatched with long reeds that grow at the rivers edge in summer. Towards the bottom right you can see one of the eel pools, where catfish and eels are farmed for food. They are also hunted from the lake far below and from the many rivers and lakes that extend deep beneath the mountains. High above some sacred finches fly. The local people believe the glowing birds are spirits of their ancestors, and tend to spoil them rotten. In return, the birds hang around, and their bioluminescent feathers provide a valuable light source to the villagers. Light is a big deal to the people of Cavetown- so they adorn their houses with torches blazing with catfish oil, to show off their wealth and status. Light is also a necessity for navigating the precarious terraces and pathways that jut from the cave walls, so acolytes from the temple are tasked with keeping the pathway lamps lighted day and night. Regrettably- I could only approach this new inspiration in my usual manner. So here’s a picture of someone in silly glasses. The annual time traveller’s tea party was held this weekend (in 1862) I was lucky enough to attend – since I knew someone going I was able to snag a lift. I got the guests to line up and then we froze time while I painted them from life. It saves time you see, plus it’s impossible to get a dodo to stay still. 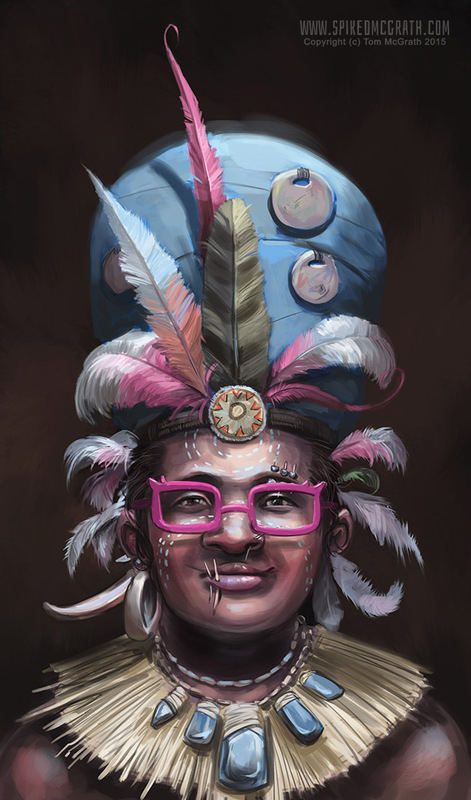 This illustration was done for Advocate Art agency’s annual “Head’s Up” calendar.